Coppell's most dominant force senior Abby White defeated her opponent eight sets to two, taking Coppell's lead to five to two. Photo by Mia. This week in Tennis held the Coppell Cowboys and Cowgirls tennis team’s biggest district match of the whole tennis season. 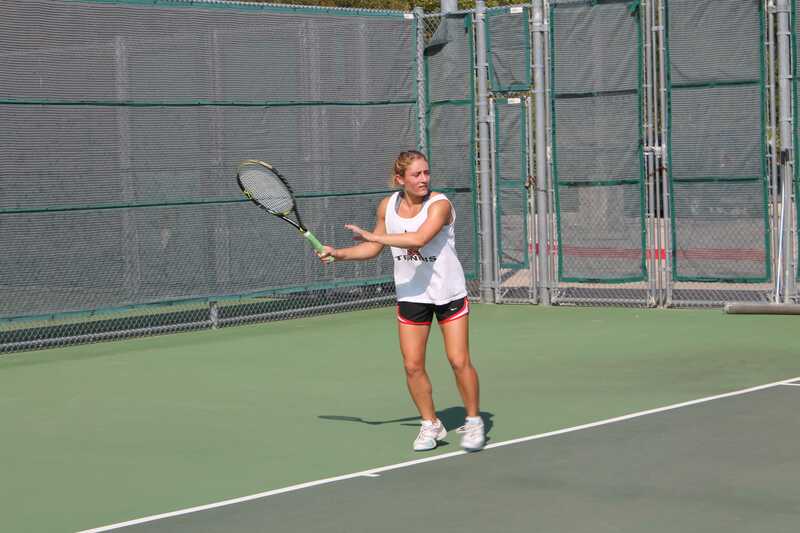 Tuesday, October 2, the varsity Coppell tennis team traveled to Marcus to face off against the Marauders. Leading into these matches, the Coppell tennis team was tied with Marcus for the first place spot in district, meaning the victor of the matches would obtain the coveted home court advantage for district playoffs. It is no accident that these two teams are number one, as Tuesday came down to the very last match with Coppell coming out on top ten matches to nine, meaning that Coppell is now number one in our district and will have a distinct home court advantage when it comes time for post season play. Tuesday’s competition began with girls doubles, where number one spot Julianne Cauley and Logan Astudillo were defeated eight games to three. Second spots Lizzie Bell and Mira Shah pulled out a commanding 8-4 win. And three spots Melissa Coburn and Maggie Stone falling short to the Marauders, who took eight games to one. After the first three rounds of sets, Coppell was down two matches to one. The second matches played were boys doubles where Coppell had a dominant showing, not losing a single one of their sets against the Marauders. Number one spots Zixiao Li and Kihwan Lee won eight games to three, two spots Tyler Stayer and Danny Bush had to go to extra gamess but still pulled out a nine to seven set win. Finally, the Cowboy’s three spot Sid Bagaria and Jacob Villanueva put together an excellent performance allowing the Marcus representatives only one game win. After two rounds of sets, Coppell held a four to two lead over their main competition. The third round of matches was mixed doubles which only has one spot. Luckily that spot is held by two of Coppell’s most dominant forces; Abby White and Josh Abaya, who defeated their opponents eight sets to two, taking Coppell’s lead to five to two. Fourth came girls doubles where Coppell seemed to struggle, only taking one match due to Abby White’s performance where she won in an extra set. When it was all said and done, Marcus had taken a seven to six lead. The fifth and final competition was boy’s singles where the Coppell varsity was able to put together a clutch performance with dominant performances by Zixiao Li, Kihwan Lee, Sid Bagaria and Kavi Shah. At the end of all competition, your Cowboy and Cowgirl varsity teams were able to pull together a ten matches to nine performance and gain a key playoff advantage as well as a definite number one district rank.